When Max Scherzer erupts on the mound, screaming obscenities into his glove, covering his mouth so the television cameras won’t accommodate the lip-readers, one has to wonder: Who is he yelling at? Is it the opposing hitters, the ones who’ve reached base fewer than once per inning in Scherzer’s three-plus seasons in Washington? Is it the umpires, the ones who’ve called strike three for Scherzer over 250 times four seasons in a row? Is it his catcher? The fans? Himself? Is it someone else entirely? Scherzer is clearly one of the most emotional players in MLB. And he’s learned to use it to his advantage. “You definitely can,” the three-time Cy Young winner replied. “It hits that adrenaline, so once that adrenaline hits, it almost feeds itself. From his swearing outbursts to talking to himself and growling at opponents, it’s not hard to figure out what’s going through Scherzer’s head. In one of his notable outbursts, Scherzer refused to be taken out of a 2015 game against the Marlins, and proceeded to scream about finishing the inning at then-manager Matt Williams, who obliged and shuffled back to the dugout in a hurry. Scherzer’s former manager, the Tigers’ Brad Ausmus, was asked about the incident the following day. 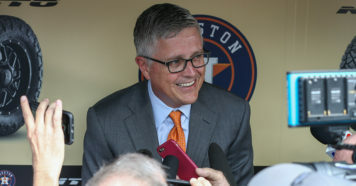 “He’s emotional on the mound,” Ausmus told reporters. “When he wants to stay on the mound, he’s very emphatic about it. He wasn’t yelling at Matt about anything. Not only does he lose himself in the moment with his managers and teammates, he’s also prone to snarling and howling at opposing players. And sometimes all he needs is some good old-fashioned alone time. Wearing his emotions on his sleeve is not a new thing for Scherzer—he’s been known for it since he was in college, and it even made him stand out to scouts. He chose to pitch at Missouri after being drafted in the 43rd round by the St. Louis Cardinals in 2003, playing three seasons at the collegiate level. But it didn’t go well for him at first; he was benched his freshman year after struggling to find the strike zone. He never forgot it. Scherzer bounced back and ended up being the 11th overall pick in the 2006 draft by the Diamondbacks, the eighth pitcher selected behind Luke Hochevar (No. 1), Brandon Morrow (No. 5), Clayton Kershaw (No. 7), and Tim Lincecum (No. 10). So far this season, he’s pitched his way to a 6-1 record with a 1.79 ERA and 0.82 WHIP. Of his seven games pitched, he’s recorded double-digit strikeouts in five of them, and never less than seven. He’s had a sub-1.000 WHIP four other seasons in his career, three of which were years he won the Cy Young. But his postseason numbers aren’t quite on par with his regular-season numbers. In 16 games (13 starts), he’s compiled a 4-5 record with a 3.73 ERA. Elimination games are his kryptonite. Even when he pitches well, the team finds a way to lose. As a Tiger in the 2011 ALCS against the Rangers, he was pulled in Game 6 after giving up six runs through 2.1 innings. The Tigers were eliminated after losing that night. Scherzer told the Washington Post in 2016 that part of his struggle that game was attempting to tone down his emotions during such a huge moment. 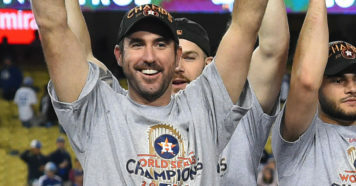 The following year, he earned a no-decision in Game 4 of the World Series against the Giants, and the Tigers were swept. The 2013 postseason wasn’t much better, when Scherzer was slapped with a loss after giving up three runs in Game 6 of the ALCS against the Red Sox. Things didn’t improve much when he signed with the Nationals. Scherzer allowed four earned runs in six innings in his first postseason start in D.C. It was the 2016 NLDS, and the Dodgers eliminated the Nationals in Game 5, a game Scherzer started. 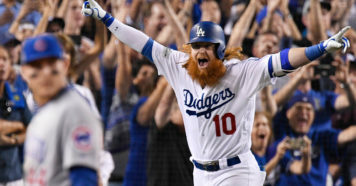 He started Game 3 of the NLDS against the Cubs in 2017, allowing just one run over 6.1 innings. The Nationals lost 2-1. But his worst playoff nightmare occurred days later in Game 5 against the Cubs. Scherzer came on in relief with a 4-3 lead. After making two quick outs, Scherzer allowed three base hits, an intentional walk, a baserunner who reached on a passed ball after striking out, another who reached by catcher’s interference, and a hit batsman. Scherzer allowed four runs that inning—two unearned—and the Nationals lost 9-8. So while it’s clear that Max Scherzer uses his emotions to fuel him, it’s also clear that one of his biggest challenges has been managing that emotion in big-game situations. What a feeling that must be as an opposing hitter: Staring at a pitcher with two different-colored eyeballs and three Cy Youngs, he’s breathing like he just ran to center field and back and he’s screaming obscenities into his glove. That’s Max Scherzer thinking clearly.